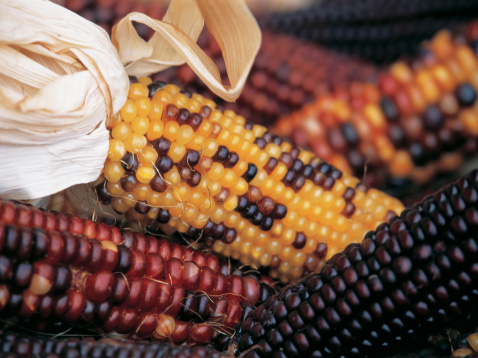 Corn is one of the most commonly grown crops in the United States. Also known as maize, cornstalks are composed of thick stems, broad leaves, the ears of corn and tassels on the very top of the plant. The cornstalks are called shocks. If you don't use leftover cornstalks for your compost pile, then decorate. After the summer is over and corn season has ended, the cornstalks begin to dry out. If allowed to continue to properly dry, the cornstalks can be used for fun decorations during the traditional fall harvest months, particularly for Halloween and Thanksgiving. Put on your gardening gloves. Cut the cornstalks at the bottom of the stem, just above the dirt line using the knife or shears. 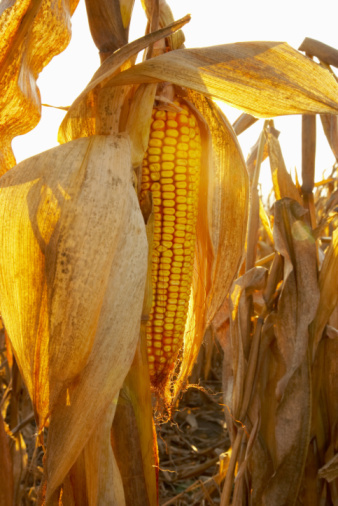 This should be done once the majority of the corn has been harvested, or the cornstalks begin to dry out or when the remaining ears' kernels harden. Though the ideal time for this varies on where you live, September is usually a good time to do this for most climes. Group the cornstalks in bundles of four. Tie the stalks together using baling twine or thick string. Tie the stalks together towards the bottom of the stalk, the middle of the stalk and the top of the stalk. Take care not to damage the leaves or tassels. Stand the stalks up in your garage, propped against the wall, sawhorses, ladders or other upright items. Leave the stalks there to dry until the middle to end of October. Remove the baling twine or string, if desired, and decorate with the stalks. You may also leave the cornstalks tied together with the baling twine or string and arrange the leaves and tassels artistically.